The NPS flag shows the brown arrowhead symbol on a green background, with a brown ribbon above stating "National Park Service". I came across this picture in the Feb. 19th edition of Newsweek. It shows US National Park Service (NPS) rangers waiting on the white house south lawn. 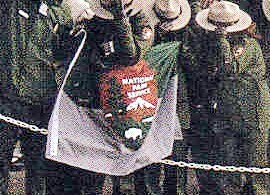 They are clearly holding the Flag of the park service, which is not often used. It is divided into equal halves: forest green top and dark gray bottom with the National Park Service shield logo in the center. Although the Department of the Interior flag is specified, some if not all of the subordinate departments are not specified. There are different versions of the National Park Service flag. Recently the most used is the striped version Ben refers to. Apparently it is up to the individual offices as to which design they use. Even the color is not specified. They choose the shade they prefer. The U.S. Park Police is a subordinate organization of the National Park Service, Department of the Interior. The flag consists of a White field, Blue "T" shape, bordered gold. Blue border, gold fringe. "United States" above, "Park Police" below. Lettering blue, and bordered gold.